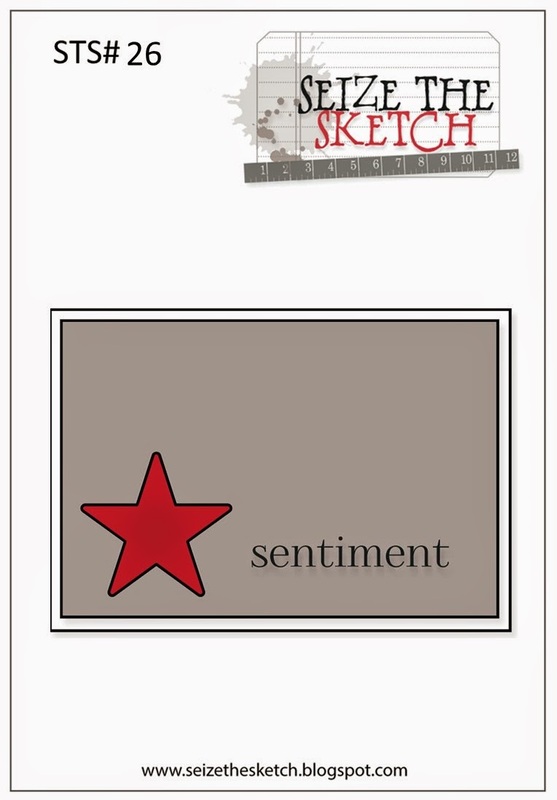 Welcome to sketch #26 at Seize The Sketch! I love, love, love this week's sketch (but then, I think that about every one I've done so far with STS!). Our sketch hostess this week is Katie Melhus. Don't you just "dig" this? (my kids would roll their eyes at me using that sentence - "Oh, Mom, you think you're so cool! ha ha!") It's super simple, but it doesn't have to be if you dress it up, like I did. 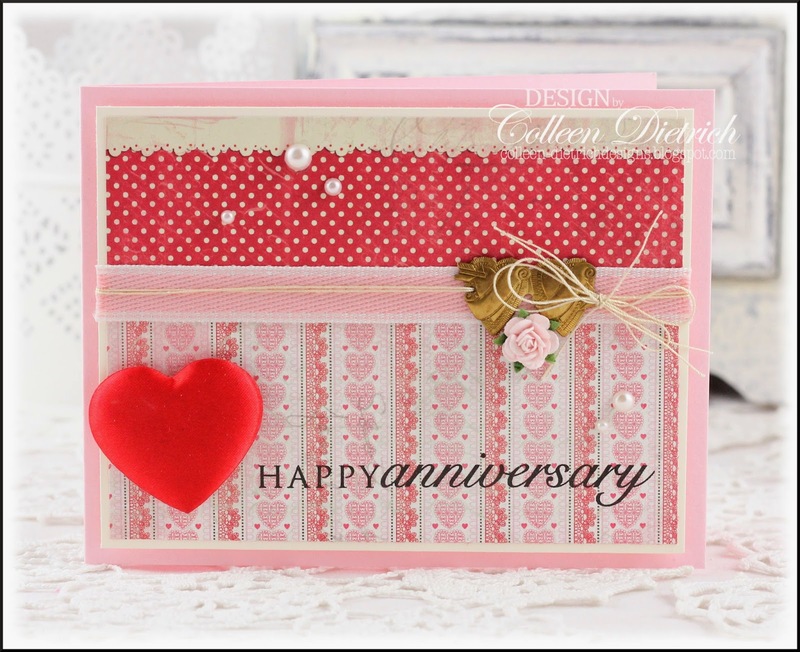 My patterned papers are from Authentique's Lovely, and though geared toward Valentine's Day, I thought they would work for an anniversary card. The sentiment is from Papertrey Ink's Think Big Favorites #16. Have I mentioned lately how much I love PTI stamps? The puffy heart is from....can you guess?...Build-A-Bear! Yes, it was found on the floor there by one of my kids many years ago. I saved it, knowing I could use it somehow. And the little double-heart gold charm is from a thrift store in Lancaster, Pennsylvania. It looked bare by itself, so I added the tiny pink paper flower to the bottom of it, but now you can hardly tell it's a pair of golden hearts! Ha! Well, thanks so much for coming today. I hope you get a chance to play with us. Challenges last two weeks, and all details can be found on the STS blog HERE. Gorgeous! LOVING the heart and pearls! Pretty card Colleen the double heart charm is so sweet! Colleen this is so pretty and just "smacks" of love and kisses - super sweet! This card is screaming love in an elegant and chic way. Beautiful patterned papers and the puffed heart is so sweet. The perfect addition! So pretty Colleen! Great mix of patterned papers! Love the 3D heart! Stunning card- your papers and colors are fabulous! This is sweet and romantic and the perfect anniversary card! Wow, very impressed by your use of recycled elements, Colleen! You are inspiring me to hoard even more! Such a sweet card! Wow! This is sooo gorgeous, Colleen! Your papers are perfect- love the wallpaper look of the striped pattern. And I am with you on PTI products; Love them! This is just precious! 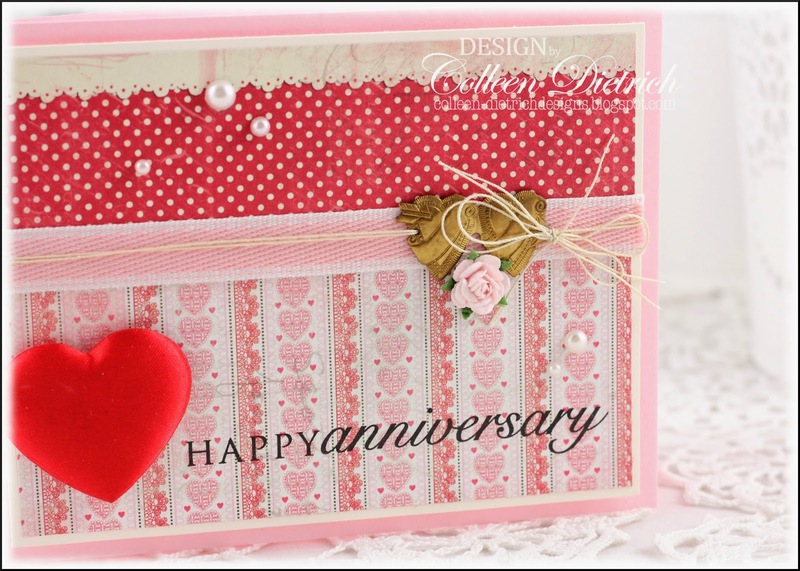 So perfect for an anniversary card :) Love all the layers - that gorgeous brass charm, rose, twine, and ribbon pack a punch!! Your colors and papers are so SWEET! LOVE it all over! I'm always inspired by Seize the Sketch. By the end of summer I'm always looking forward to winter so I'll have more time to stamp. I'd love to sit down with this sketch right now! This is beautiful! I love the little "found" elements you used to make a very special one of a kind card. Adorable. Colleen ! I love the papers and that pretty heart! Beautiful,charm ad tiny rose. Colleen, can't leave you alone for a minute! The DPs are great and I 'dig' the design too~ Great use of the build a bear heart! A really fun and pretty card!